this is probably the easiest soup recipe that i have ever made. 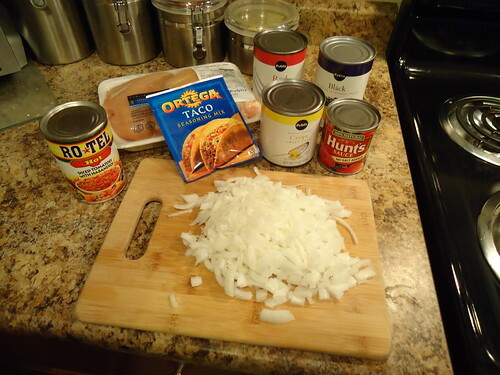 the original recipe that i used needs some tweaking, as it was excessively “beany.” nevertheless, it’s very simple to make and is really good served with chicken quesadilla rolls on the side. even better, it can cook in your crockpot all day. 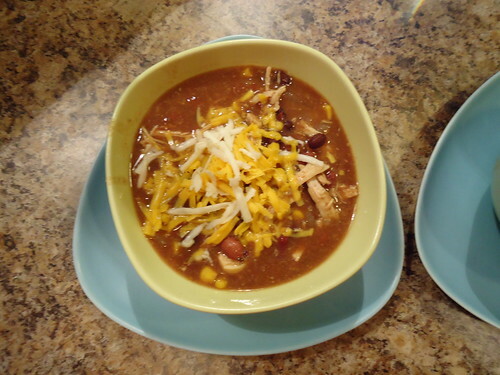 place the onion, chili beans, black beans, corn, tomato sauce, beer and diced tomatoes on a large bowl. add taco seasoning, stir to blend. cover and refrigerate overnight. remove the chicken breasts from the soup, allow to cool enough to be handled. shred the chicken using a knife and fork. stir the shredded chicken back into the soup, cook until you’re ready to serve. serve over crushed tortilla chips and top with cheese and/or sour cream.